LOWER EAST SIDE — Tenants in a sprawling affordable housing complex on the Lower East Side are fighting a proposed 13 percent rent hike that would result in more than $3 million in extra rent over two years. The tenants association at Knickerbocker Village — which represents residents of a dozen 13-story buildings between the Manhattan and Brooklyn bridges — is speaking out against the proposed increase, calling it unfair to the many low- and middle-income residents of the 1,600-unit complex. “We know that the rent increase is going to happen. We just want to make sure it’s a fair increase,” said Isabel Reyna Torres, a resident of 16 years and member of the Knickerbocker Village Interim Tenants Association, which was recently formed after the previous tenant group disbanded. Tenants said a 9 percent increase would be more reasonable. They believe Knickerbocker Village can afford a smaller rent increase, based on a report they commissioned by accountant Henry Singer. Singer found that the complex's management kept some apartments vacant for as long as four years, which means the complex missed out on more than $400,000 in lost rent that could have been used to pay bills and offset the need for a steep rent hike, tenants say. “Long-term vacancies included penthouses and the two- and three-bedroom apartments desperately needed by families living for years with children in overcrowded one-bedrooms at the complex,” the tenants group said on Monday. Elected officials have told the state's Division of Housing and Community Renewal, which must approve the rent hike, that they believe it was illegal for Knickerbocker Village to warehouse vacant apartments. Tenants should not have to pay higher rents because of Knickerbocker Village’s decision to keep units empty, tenants and elected officials said. "We are asking that [DHCR] delay granting any increase until it determines if a violation occurred and to disallow any increase to cover the cost of the vacant apartments," Rep. Nydia Velazquez, Manhattan Borough President Gale Brewer, state Sen. Daniel Squadron, Assembly Speaker Sheldon Silver and Councilwoman Margaret Chin wrote in a letter to DHCR. "The owner should also make up the revenue that was lost by keeping apartments vacant." Knickerbocker Village and DHCR officials did not return requests for comment. The complex is part of the state’s Mitchell-Lama program, which creates affordable housing for middle-income families. The tenants association has collected more than 800 signatures opposing the rent increase. The issue was supposed to go before DHCR at a hearing in July but the tenants won an additional 60 days to organize. 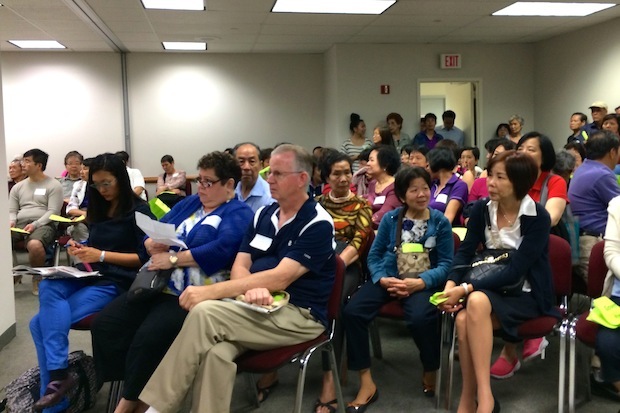 More than 120 tenants showed up to the new public hearing Tuesday morning at the DHCR office at 25 Beaver St., but the meeting was postponed because a translator had not been provided for those who speak Fujianese, a Chinese dialect. The next hearing will take place in two weeks, DHCR attorney Kurt Seidman said at the meeting. To accommodate residents, the hearing will take place in the evening at a public school close to Knickerbocker Village, he said.